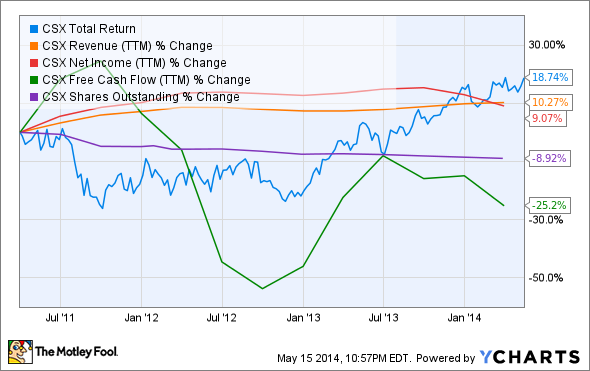 Is CSX Corporation Destined for Greatness? Let's see what the numbers say about CSX (CSX). Investors love stocks that consistently beat the Street without getting ahead of their fundamentals and risking a meltdown. The best stocks offer sustainable market-beating gains, with robust and improving financial metrics that support strong price growth. 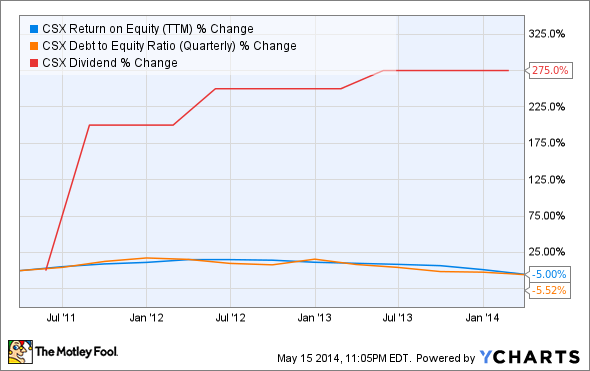 Does CSX Corporation (NASDAQ:CSX) fit the bill? Let's take a look at what its recent results tell us about its potential for future gains. CSX's performance has deteriorated a bit since we examined it last year, as the railroad operator mustered a modest four out of nine possible passing grades today, one fewer than its 2013 score. The company's free cash flow levels have continued to decline, which may lead to dividend cuts if it's not reversed, as CSX already pays out about a quarter of its free cash flow in shareholder distributions. Will CSX be able to prop up its falling free cash flow and manage its operations more efficiently this year? Let's dig a little deeper to find out. Although CSX delivered better-than-expected revenue and earnings per share for its first quarter, this was merely outperforming low expectations -- the company's net income and operating profit declined by 14% and 16%, respectively, due to weather-related problems, which have bedeviled companies across the country this winter. CSX's operating ratio also slipped 520 basis points to 75%, which is a fair bit worse than industry leader Canadian National's operating ratio of 63.4%. Despite its high payout ratio, the company also announced plans return more cash to shareholders through a 7% dividend boost. My fellow Fool Justin Lacey notes that coal shipments to global export markets declined by 15%, which has put pressure on CSX to find greater shipment volumes elsewhere. However, CSX's management still foresees modest full-year earnings growth, which should still be driven by increased demand for coal, as natural gas prices have been on the upswing over the last few months. CSX will benefit from natural gas in other ways as well, as it's teamed with General Electric (NYSE:GE) to develop LNG-powered locomotives with GE's NextFuel kits, which could save millions of dollars now being spent on diesel fuel. Justin also notes that Western Canadian farmers harvested a record 80 million tonnes of grain and oilseed last year, which is expected to hit domestic markets this year. CSX should be able to capitalize on this flood of farm commodities, as it aims to convert over 9 million truckloads to rail-based intermodal transport. However, railroads in the U.S. presently lack the infrastructure to adequately handle surging demand, which has led to rail traffic congestion and delivery delays. As a result, railroad operators are left with weaker negotiating power compared to trucking operators, which has undermined revenue growth for the past few years. Foolish writer Jay Wei points out that domestic railroad operators continue to invest in new tracks and infrastructure to avoid unnecessary traffic congestion and delivery delays, and this has been the reason why CSX's free cash flow has taken a tumble in recent quarters. Earlier this month, a CSX train derailed and caught fire in Virginia, which could cause long-term reputational harm to railroads involved in transporting crude oil and petroleum products. Fool writer Dan Caplinger suggests that railroads may face potentially tighter regulations in the aftermath of this derailment, which could crimp a vital source of revenue from booming but hard-to-reach oil shales. However, persistent challenges to new oil pipelines, combined with increasingly congested urban roadways, gives North America's railroad operators significant tailwinds in the oil patch. CSX and its peers are also likely to benefit from increased trucking regulation, which has reduced the average driver's workweek to 70 hours from 82 hours just last year. Today, CSX has some of the qualities that make up a great stock, but no stock is truly perfect. Digging deeper can help you uncover the answers you need to make a great buy -- or to stay away from a stock that's going nowhere.